DeBary is a city in Volusia County, Florida, United States, on the northern shore of the St. 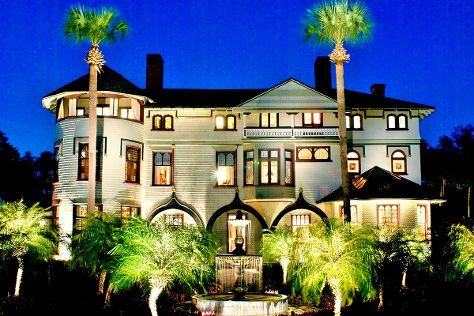 Deepen your sense of the past at sights like Stetson Mansion and Dunlawton Sugar Mill Gardens. Step out of the city life by going to Blue Spring State Park and Hidden Waters Preserve. Venture out of the city with trips to Silver Springs State Park (in Silver Springs) and Modernism Museum Shoppe (in Mount Dora). It doesn't end there: pause for some serene contemplation at St. Barnabas Episcopal Church. To find other places to visit, reviews, ratings, and tourist information, go to the DeBary trip website . Annapolis to DeBary is an approximately 8.5-hour flight. You can also drive. When traveling from Annapolis in November, plan for much warmer days and somewhat warmer nights in DeBary: temperatures range from 78°F by day to 60°F at night. You will leave for Orlando on the 15th (Thu). Start off your visit on the 15th (Thu): get in on the family fun at Walt Disney World Resort. On the 16th (Fri), you'll have a packed day of sightseeing: make an unforgettable trip to Disney's Animal Kingdom. To see photos, maps, reviews, and other tourist information, you can read our Orlando trip itinerary planner . Drive from DeBary to Orlando in an hour. In November in Orlando, expect temperatures between 78°F during the day and 62°F at night. Finish your sightseeing early on the 17th (Sat) so you can drive to Fort Lauderdale. Start off your visit on the 17th (Sat): admire the landmark architecture of Art Deco Historic District and then tour the pleasant surroundings at South Beach. On the next day, get a new perspective on things with Boat Tours & Water Sports, appreciate the extensive heritage of Art Deco Tours, and then admire all the interesting features of Lincoln Road. For where to stay, traveler tips, ratings, and tourist information, read Fort Lauderdale online trip builder . You can drive from Orlando to Fort Lauderdale in 4 hours. Other options are to take a bus; or take a train. Plan for a bit warmer nights when traveling from Orlando in November since evenings lows in Fort Lauderdale dip to 69°F. Cap off your sightseeing on the 19th (Mon) early enough to go by car to Naples. Naples is a city in Collier County, Florida, United States. Take a break from the city and head to Waterskiing & Jetskiing and Fort Myers Beach. Deepen your sense of the past at sights like Edison & Ford Winter Estates and Sanibel Island Lighthouse. There's more to do: take in the waterfront at Naples Pier. To find maps, ratings, other places to visit, and tourist information, read our Naples online trip maker . You can drive from Fort Lauderdale to Naples in 2 hours. Alternatively, you can take a bus. November in Naples sees daily highs of 82°F and lows of 65°F at night. Wrap up your sightseeing by early afternoon on the 22nd (Thu) to allow enough time to travel back home. New Bern is a city in Craven County, North Carolina, United States. Kick off your visit on the 23rd (Fri): browse the exhibits of North Carolina History Center - Tryon Palace, contemplate the long history of Birthplace of Pepsi-Cola, and then immerse yourself in nature at Fort Macon State Park. On the 24th (Sat), you'll have a packed day of sightseeing: meet the residents at North Carolina Aquarium at Pine Knoll Shores and then admire the majestic nature at Fort Macon. For where to stay, maps, traveler tips, and other tourist information, you can read our New Bern attractions planner . Traveling by car from Naples to New Bern takes 15 hours. When traveling from Naples in November, plan for slightly colder days and cooler nights in New Bern: temperatures range from 66°F by day to 43°F at night. On the 25th (Sun), wrap the sightseeing up by early afternoon so you can travel back home. Myrtle Beach is a coastal city on the east coast of the United States in Horry County, South Carolina. Get ready for a full day of sightseeing on the next day: explore the landscape on two wheels at Pee Dee Bicycle, then kick back and relax at Myrtle Beach, and then make a trip to Myrtle Beach SkyWheel. To find ratings, where to stay, maps, and other tourist information, go to the Myrtle Beach trip builder . Fly from New Bern to Myrtle Beach in 4 hours. Alternatively, you can drive; or do a combination of taxi and flight. November in Myrtle Beach sees daily highs of 66°F and lows of 46°F at night. Wrap up your sightseeing by early afternoon on the 28th (Wed) to allow time for travel back home. On the 28th (Wed), take in the local highlights with Walking tours. Get ready for a full day of sightseeing on the next day: steep yourself in history at Magnolia Plantation & Gardens. For photos, maps, traveler tips, and more tourist information, you can read our Charleston itinerary builder tool . Getting from Myrtle Beach to Charleston by car takes about 2.5 hours. Other options: take a bus. In November, daytime highs in Charleston are 68°F, while nighttime lows are 49°F. You'll set off for home on the 1st (Sat). Kick off your visit on the 1st (Sat): take in the spiritual surroundings of Cathedral of St. John the Baptist, tour the pleasant surroundings at Forsyth Park, then take in the spiritual surroundings of Mickve Israel Temple, and finally appreciate the extensive heritage of Savannah Historic District. On your second day here, trek along Hilton Head Island Bike Trails, then zoom along the surf with a waterskiing or jet-skiing adventure, and then take in the architecture and atmosphere at The Church of the Cross. For ratings, maps, photos, and more tourist information, go to the Savannah trip planner . Traveling by car from Charleston to Savannah takes 2.5 hours. Alternatively, you can take a bus. Expect a daytime high around 66°F in December, and nighttime lows around 47°F. Wrap up your sightseeing on the 3rd (Mon) to allow time to travel back home.